Septarians were formed millions of years ago when the Gulf of Mexico reached what is now Southern Utah. These Utah Septarian Nodules are NOT Native. In our travels we have found some beautiful art work that is NOT Native but have been created in the Native American Spirit. With that thought in mind what you will view in this section are NOT authentic Native American pieces. Original & Unique Copper Art with Native American Designs by artist Terri Dennis. The artwork in this section is NOT authentic Native American pieces. In our travels we have found some beautiful 3 dimensional Metal Art that is NOT Native but have been created in the Native American Spirit. These pieces will add a nice touch to your Native American style decor. Here you will find afghans, world gem globes, carved moose antlers, pillows and more. 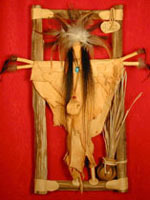 These pieces will add a nice touch to your Native American style decor. Here you will find sterling silver necklaces, bracelets, fetish pendants and more. These items are NOT authentic Native American made. 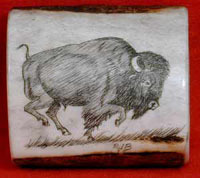 Scrimshaw is one of the oldest American crafts which originated with the Native Americans along the Northwest Coast of North America. 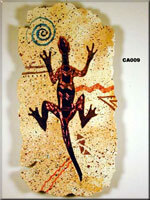 These beautiful art work that is NOT Native but have been created in the Native American Spirit.